Come this Saturday, three of my sisters will have married within seven months (! ), and each celebration has served as a lovely way to reconnect with extended family. 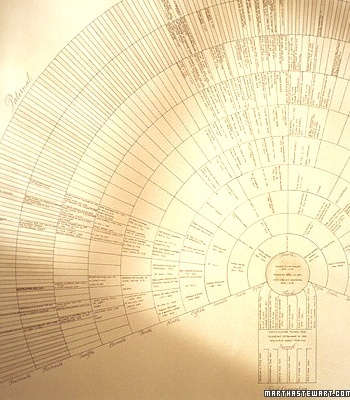 Which has prompted me to revisit my life list item about creating a family tree. Why? Because I've always found my family history (with its large and complicated branches) confusing (the levels of cousins are particularly puzzling), and it's been challenging to attempt to explain these relations when Laurel (invariably) asks. Strangely enough, as I've been reuniting with family and mulling the family tree project, HomeAway approached me about writing a post related to modern day family reunions. And I thought, awesome! This is the perfect inspiration to think about my previous faulty starts with this project and do some research on design. So today, thanks to the support of HomeAway, I wanted to share my tips on how to create a family tree, as well as some visual inspiration. Whether it's at the data collection stage or the design phase, let go of perfection. I have literally started and stopped this family tree project at least a half dozen times in the last 8 years (I started having a strong urge to understand my family connections better when Laurel was born) because I got frustrated by the imperfections (and time consuming nature) of the data collection process I was envisioning. Obviously, the deeper you go, the more research you will need to do. If you dig research, then go for it, but if you find that making the project too ambitious is making it not happen, then reduce the number of generations. I feel that for my own purposes and for the benefit of Laurel and Violet, I want to go as far as the people I knew. Meaning, my family tree will go four generations (from my kids to my grandparents). Also, remember that you can always go deeper later. This has been another stumbling point for me. My data oriented nature has wanted to include everything -- birth, death, marriage, etc. dates and full names. I have let go of this and decided to simply get the names and connections down. If you do want to get detail oriented, you'll probably need to engage in some family interviews and on-site or database research. I think it's wonderful to use a family reunion as a data collection opportunity (I'm envisioning a huge sheet of kraft paper and everyone can jot down the info they know). Or take advantage of social media to collect photos and information. This fan chart from Martha Stewart has a traditional look and tracks an impressive number of generations. This design is good for those who want to go deep historically and map out the connections accurately in a visual format. 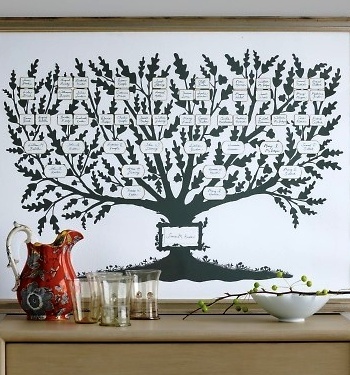 This giving tree (also by Martha Stewart) would look so pretty on your sideboard, no? 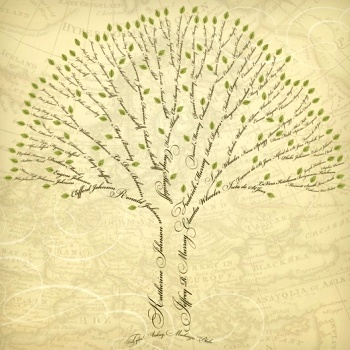 I think this text based tree from Legacy Digital Design has such a pretty, classic look. 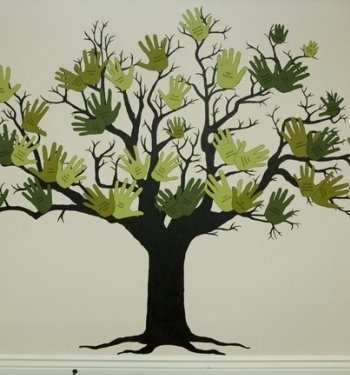 Multitask your leaves + data with this handprint tree. This would be a great project to do at a family reunion -- have everyone trace their own hand and fill out the information. I love how the little handprints add dimension and an immediate rendering of the younger generation. 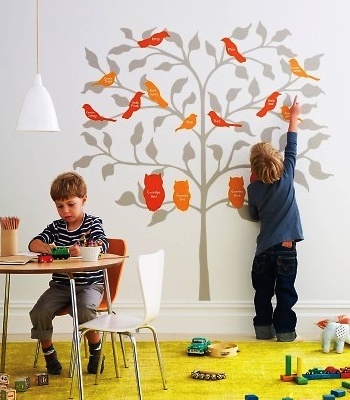 Another great option via Martha Stewart is this bird tree design. Like the handprints, it multitasks the motif (birds) with the data. 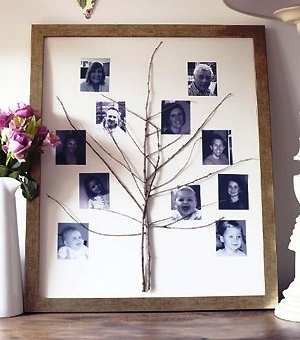 If you want to keep things simple and just go a generation or two, I love this twig and photo design via All About You. For those who love minimal, modern lines, this photo/shelf tree (found via Lil Sugar) is perfect for you. So clever! 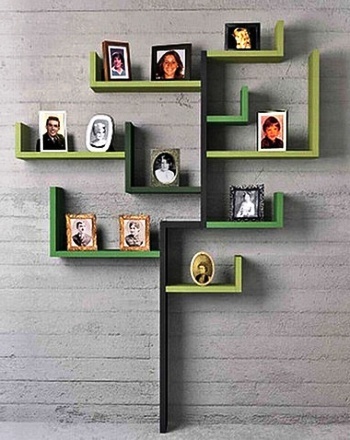 I positively swooned when I saw this family tree (literally!) via Holly Mathis Interiors. 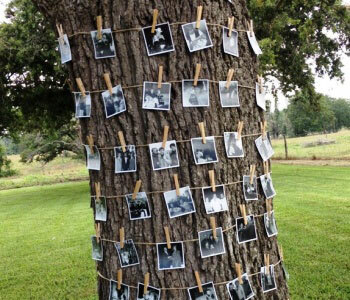 Obviously, it's not practical from a permanence standpoint, but wouldn't it be awesome in advance of a family reunion (at a wedding or otherwise) to ask family to bring photos for a family tree and display it like this? LOVE.